The emergence of the discipline of encapsulation and controlled release has had a great impact on the food and dietary supplements sectors; principally around fortifying food systems with nutrients and health-promoting ingredients. The successful incorporation of these actives in food formulations depends on preserving their stability and bioavailability as well as masking undesirable flavors throughout processing, shelf life and consumption. 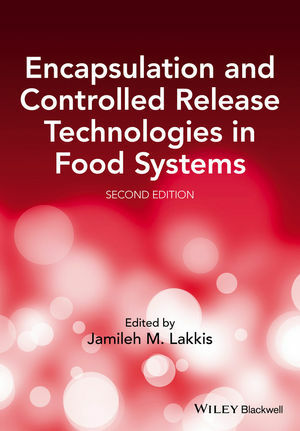 This second edition of Encapsulation and Controlled Release Technologies in Food Systems serves as an improvement and a complement companion to the first. However, it differentiates itself in two main aspects. Firstly, it introduces the reader to novel encapsulation and controlled release technologies which have not yet been addressed by any existing book on this matter, and secondly, it offers an in-depth discussion on the impact of encapsulation and controlled release technologies on the bioavailability of health ingredients and other actives. In common with the first edition the book includes chapters written by distinguished authors and researchers in their respective areas of specialization. This book is designed as a reference for scientists and formulators in the food, nutraceuticals and consumer products industries who are looking to formulate new or existing products using microencapsulated ingredients. It is also a post-graduate text designed to provide students with an introduction to encapsulation and controlled release along with detailed coverage of various encapsulation technologies and their adaptability to specific applications. Dr Jamileh M. Lakkis has more than 20 years’ experience in the food, dietary supplements and consumer products industries. She has been very active in promoting and implementing microencapsulation and controlled release technologies in these industries.